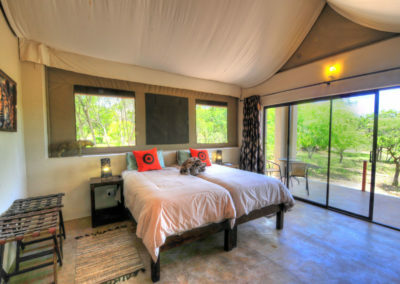 Nestled in the bush but in close walking distance to the main lodge, all luxury tents offer our guests a private atmosphere. 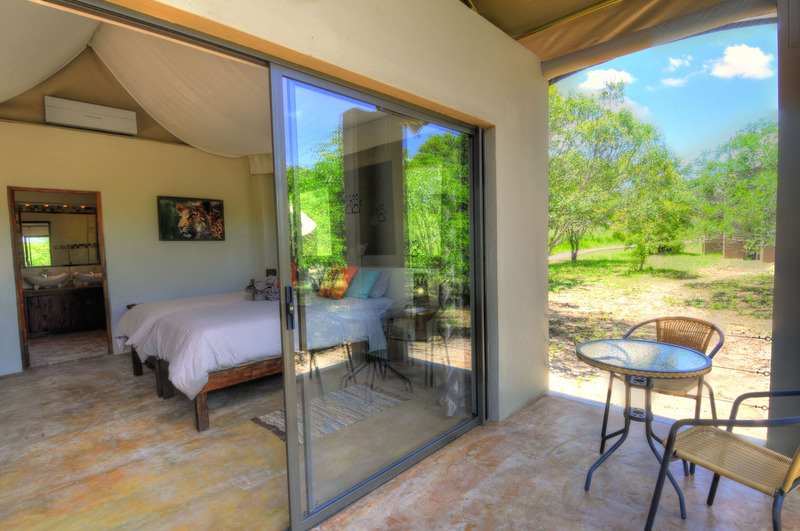 Each terrace faces a waterhole with a breathtaking view of the bush and the Drakensberg Mountains. 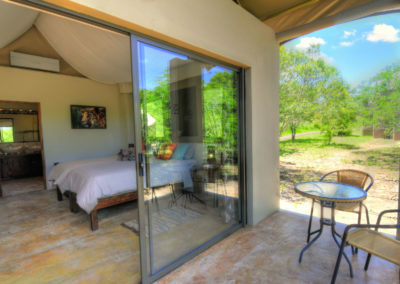 You can watch animals drinking at the waterhole or enjoy the stunning sunsets in the mountains, and unwind in the tranquil atmosphere of the South African bush. 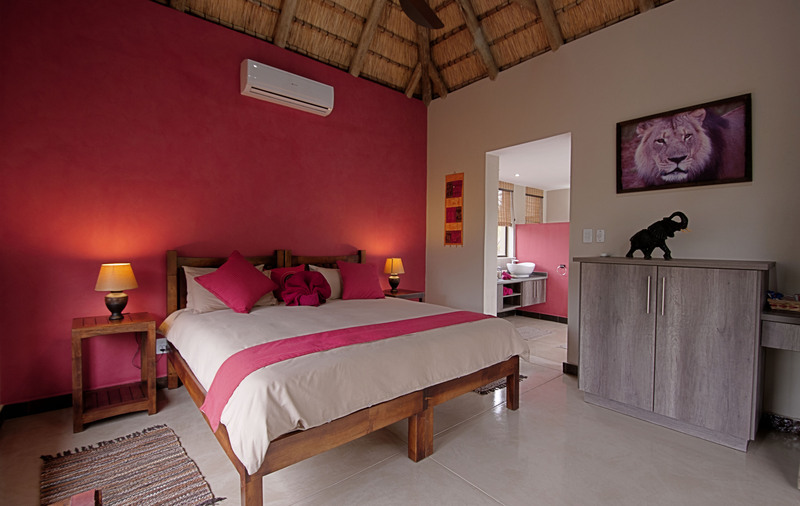 Two new superior deluxe chalets were recently added to the exclusive accommodation offer. Surrounded by the thicket alongside the small perennial river, each chalet has its own private wooden deck with its private view overlooking a natural waterhole, which is frequented by the African animals. These are ideal romantic getaways. 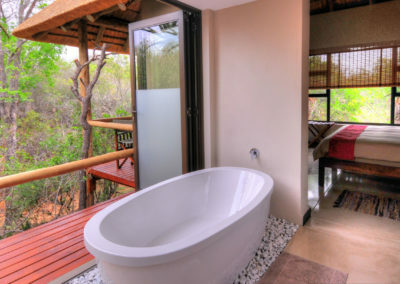 Both the luxurious tented accommodations and the deluxe chalets feature en-suite bathrooms with dual basins, bathtub, inside and outside showers and an enclosed toilet. 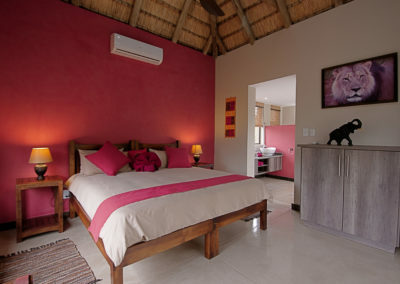 Cooled by eco-friendly air conditioning, the rooms are equipped with a safe, hair dryer and tea and coffee facilities. 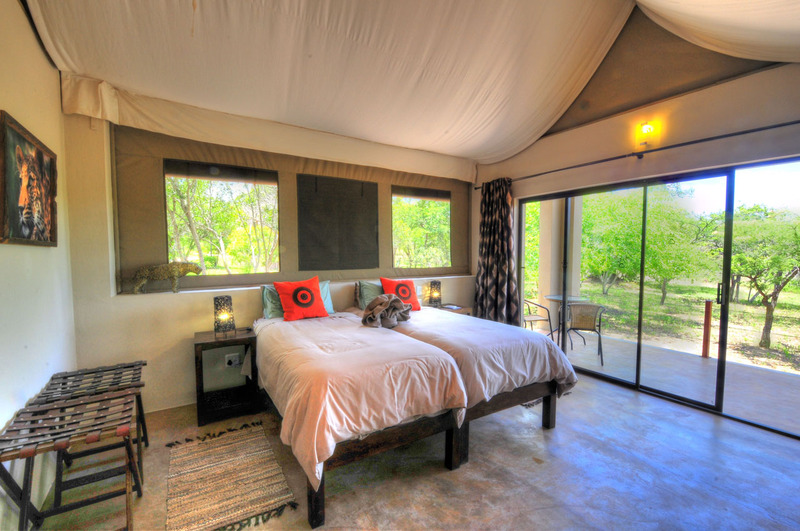 You stay in a luxury accommodation but feel close to nature with the African bush right outside your door. All additional activities. Rates will be provided on request. Laundry Service. ZAR 100 per bundle. Transfers. Rates will be provided on request. Malaria precautions are recommended. Please consult your physician. Mosquito repellent spray or lotion with DEET level minimum 30%. Camera and plenty of memory cards. Summer (October-April): Light neutral coloured clothing, warm clothing for game drives. Winter (May to September): Light neutral clothing for day wear, very warm clothing for evenings/early mornings, also a warm insulated jacket for game drives. Sun hat, sun protection and sun block. Bathing costume. Swimming towels are provided. Books that help you to recognize South African animal and bird species. Travel Insurance: Please make sure you arrange your own travel insurance at your home country prior to your trip. The Insurance should have proper coverage of accident, medical emergency, evacuation, theft/loss of belongings, delay/cancellation, third party liability, etc. Immigration paperwork: Please consult the South African consulate in your home country regarding required paperwork. South African Immigration Act requires travellers younger than 18 years to present an unabridged birth certificate as well as a passport when leaving, transiting or arriving in South Africa. Please make sure your paperwork is in place when travelling with minors.